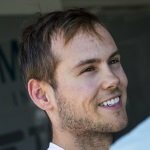 British born racing driver, Tom Blomqvist, joins MS + AD Andretti for season 4. Blomqvist began his career in 2003 in karting where he stayed until 2008 picking up 8 titles before he left his New Zealand home to race in Europe. In 2009 Blomqvist raced in Formula Renault 2.0 Sweden and finished his season in third before racing in the Formula Renault UK winter series. In 2010 Blomqvist won his first European series as he became Formula Renault UK champion. In this same year, Blomqvist won the Autosport British Club Driver of The Year and the Henry Surtees award at the British Racing Drivers’ Club in recognition of his success. Blomqvist’s career continued to grow as he showed promise across several racing series in Europe which led to his joining the McLaren Driver Development Programme, giving him recognition as one of the brightest talents around. His success continued through to 2015 when it was announced that Blomqvist had secured a seat in BMW DTM. He joined the RBM team where he ended the season with a new record under his belt as he became the youngest driver to end the season in the top 10 after finishing in sixth.